Preface: before you say “fear monger” please read the post in its entirety. 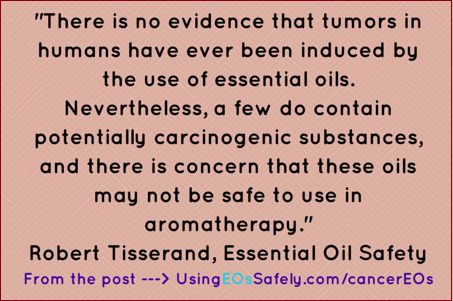 There have been no reports of cancer being linked to essential oil usage – yet. There are also safe ways to use potentially carcinogenic essential oils, and guidelines are provided below. This post is not meant to instill fear, but create awareness and respect for the essential oils which are mighty powerful tools. Essential oils are made up of dozens – sometimes hundreds – of chemical constituents. Some of these constituents are potentially carcinogenic; others are anti-carcinogenic; some are neither. 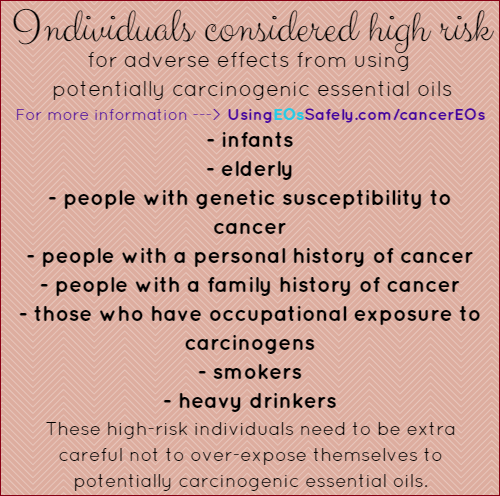 I realize there are many other more dangerous substances out there which also cause cancer, and I would agree that essential oils are not high on the list of potential carcinogens. However, due to the popularity of ingestion that is promoted by marketers in some essential oil circles, the cancer potential needs to finally be addressed. Multiple drops of essential oils consumed on a daily basis are encouraged by some of these marketers – and some of the essential oils used are potentially carcinogenic. It is this kind of regular, long-term use that can put one at risk. This post is intended as a reference point only. 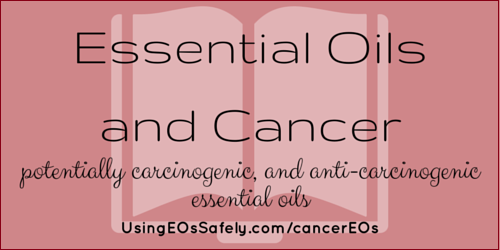 You can find additional information in Essential Oil Safety – Chapter 12, Cancer and the Immune System. This chapter discusses this issue at great length, with hundreds of references and research data to support the information therein. Individual susceptibility and exposure level are two main risk factors. Not everyone will respond to the same substances in the same way – the human body is way too complex for that. One person might consume essential oils on a daily basis for a year before they notice adverse effects; others may feel ill after one ingestion. There are many factors, such as individual diet, overall health, age, and other environmental exposures. These high-risk individuals need to be extra careful not to over-expose themselves to potentially carcinogenic essential oils. The longer you have been exposed to high-dose dilutions or oral consumption of potentially carcinogenic essential oils, the higher your risk for developing cancer. There is no exact science to this, as everyone is different. If you are one of the high-risk groups, you need to use extra caution. Without getting into too much detail about cancer and how it works (that is not the primary focus of this post), some essential oil constituents may stimulate cell proliferation, while others may increase the amount of oxygen radicals. Some constituents initiate carcinogenic action, while others may promote carcinogenic action if initiated by another substance. Other essential oil constituents may exhibit estrogen-like activity. There are many different actions essential oils can take. After researching the potentially carcinogenic constituents (such as estragole, methyleugenol, and safrole), I looked up in Essential Oil Safety the essential oils which contain significant amounts of these constituents. This list is a result of that research. 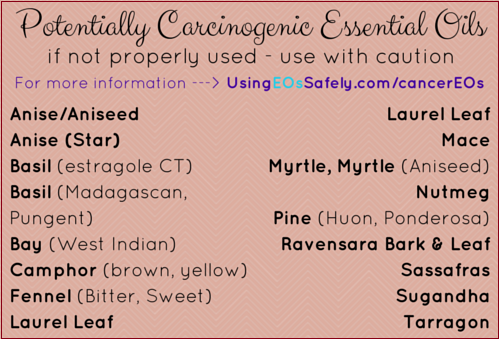 Some essential oils contain a high enough percentage of a potentially carcinogenic constituents that they should be avoided altogether and are included in this list here: Essential Oils to Avoid Using Internally and Externally. The other essential oils can be used – but with caution. If you choose to use them, please follow these dilution guidelines to be sure you are not putting yourself at risk. Generally speaking, these dilutions are for topical use only, and ingestion should be avoided. 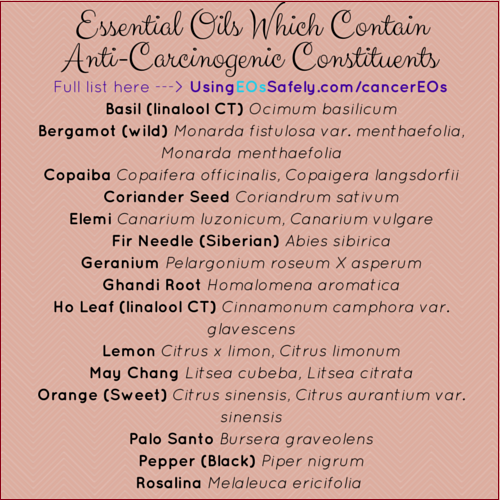 Now for the good news…there are essential oils which contain constituents that are anti-carcinogenic. They inhibit one or more stages of a cancer's progression. This does not mean essential oils cure cancer. 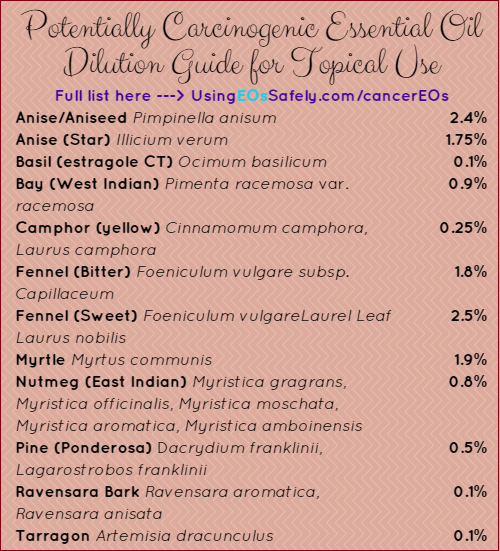 Just like it takes several factors for potentially carcinogenic essential oil constituents to cause cancer, it also takes a lot of work for these essential oils to help with preventing cancer. 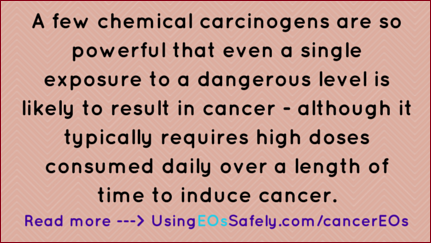 Sometimes the presence of anti-carcinogenic essential oil constituents can negate the carcinogenic potential of an essential oil. Some have anti-tumoral properties. I looked up in Essential Oil Safety the essential oils which contain significant amounts of these constituents. This list is a result of that research. For more information, please consult Essential Oil Safety, Chapter 12. Thank you for all this information. Question….in the dilution process you give percentages like .2% and 1.75%. How do I figure out that ratio or percentage of carrier oil to essential oil?